It's Native American Summer Days in Indian Falls, and Rebecca Robbins is roped into taking a turn in the Senior Center dunk tank. That is until her rhinestone-studded grandfather needs help setting up his Elvis act. Now Rebecca has to find a replacement and roller derby girl Sherlene-n-Mean is delighted to fit the bill -- until she's dunked and ends up dead. The cops want Rebecca to stay out of the investigation, but she was supposed to be in that dunk tank, which means her life could be hanging in the balance. Aided by a trio of self-appointed bodyguard derby girls, Rebecca digs for answers, dodges bullets and races to find the killer before the killer finds her. 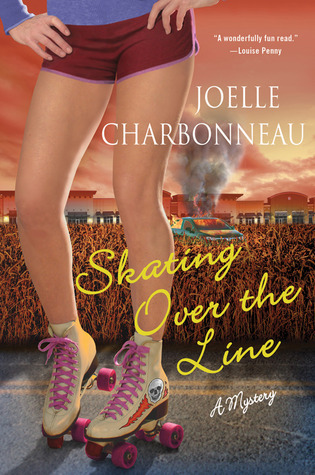 Skating on the Edge is the third, and by far the most heart racing, novel of the quirky mystery series penned by Joelle Charbonneau. 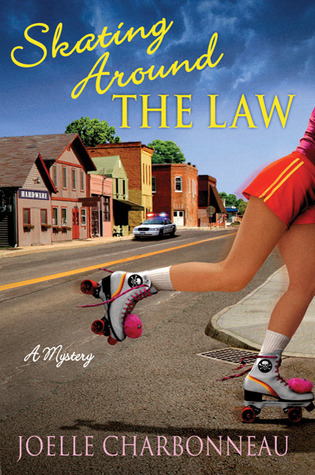 The series so far has perfectly portrayed the fun of owning a roller skating rink in a small gossipy town, but this round, readers get a deeper look into of the heart of Rebecca Robbins. The previous novel, Skating Over the Line, features the first appearance of the roller derby team, EstroGenocide. In Skating on the Edge, one of their own is murdered and the rumors floating around say it should've been Rebecca. Armed with a list of potential suspects, Rebecca takes the initiative to find the murderer while attempting to put her life back in order. Well, in as much order as possible with an Elvis-impersonating grandfather, scheming, sneaky father, and maid of honor duties. Charbonneau really knows how to work with mysteries in small towns, where everyone knows everyone and gossip is the number one source for entertainment. Her ability liven up the story and keep it going while Rebecca struggles to solve the murder case, an element found in all three mysteries in this series, is commendable and a highly favorable trait of her writing style. After reading the crazy events of this novel, readers who haven't fallen for Rebecca Robbins will do so quickly and surely. 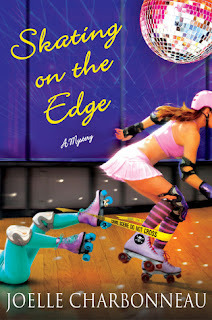 Skating on the Edge will blow you over with a fun, fabulous plot, and anticipation of what could possibly come next! Welcome to Lovey Dovey Books Joelle! Can you tell us a little about yourself? Hi Candace! Thanks so much for letting me stop by. Let’s see…I’m a tall with red hair, which means I stick out like a sore thumb in a crowd. I’m also a stage performer turned voice teacher with a passion for music and all things literary. Both of those passions my husband and I are hoping will be passed along to our four-year-old son. For readers unfamiliar with your books, how would you describe your writing style in three words? Yikes! Three words…hmm… I would describe my mysteries as wacky, fun, and fast-paced. 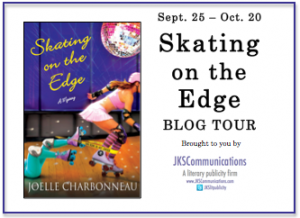 What wild antics can readers expect in Skating on the Edge? Skating on the Edge features the Toe Stop roller rink’s very own Flat Track Roller Derby team—EstroGenocide. They are bold, brash and incredibly fun to write. Add them to the mix of Elvis impersonator Pop and the hat wearing Elwood and things get really interesting really fast. Oh and Rebecca’s still working out the kinks in her love life, which never goes smoothly, but it’s always fun. Rebecca Robbins comes across very eccentric characters when solving mysteries. How do you come up with their personalities to mesh with the story? I’d like to say I have a great plan when it comes to adding characters into the story. That would make me sound smart and forward thinking. However, I tend to be a fly by the seat of my pants writer. I start out with an idea for a story, sit down at my computer and am sometimes very surprised at what characters show up and what kind of personalities that possess. The best part about small towns is that there tend to be more larger-than-life personalities in those communities. No matter how much people might want to blend in, they just can’t. More often than not, they swing in the other direction. My father was from a small town in the Upper Peninsula of Michigan. The people watch after each other. They also embrace people being themselves no matter how eccentric. What has been your favorite aspect of writing Rebecca’s stories? I love writing Elwood. I mean, what’s more fun that writing about an ex-circus, hat-wearing camel? I’ve also had a wonderful time getting to know members of the artistic and derby roller skating communities. They are passionate about their sports and enthusiastic about sharing that passion. Will there be more novels about Rebecca in the future? I am happy to report that book 4 of the Rebecca Robbins novels, Skating Under the Wire, is under contract and will come out from Minotaur books next year. Any excuse to visit Indian Falls and hang out with Pop, Rebecca and the gang is good by me! 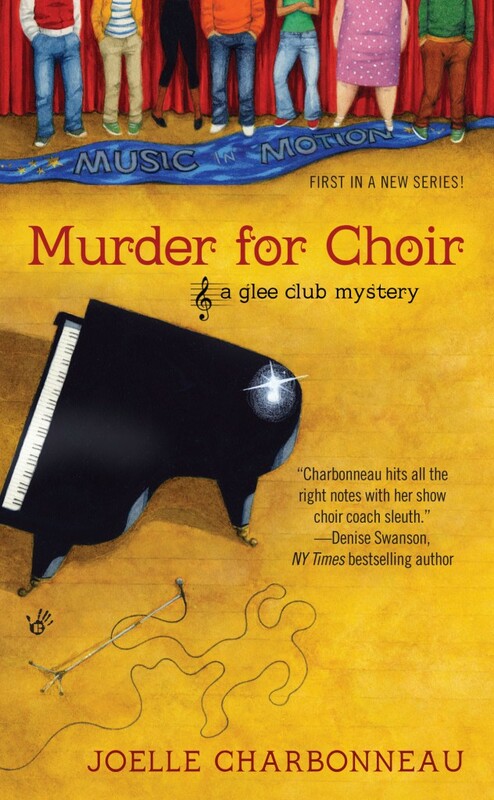 Your experience as a performer and voice teacher added reality to your latest release, Murder for Choir (Glee Club Series). Are there any life experiences that helped create the world of Rebecca Robbins? As I mentioned, my father’s childhood community helped inspire the town of Indian Falls. But the biggest inspiration for the series comes from my mother’s past experience as a World Champion Artistic Roller Skater. After my mother stopped competing, she worked for years as a roller skating instructor and choreographer, which meant I spent many Saturdays of my childhood inside roller rinks. It’s amazing what I remember. And anything that I don’t…well, I’m lucky that my mother is only a phone call away! Thank you for stopping by Joelle! Any parting words for your fans? I just want to give my heartfelt thanks to each and every reader who spends time in Indian Falls. The only reason I get to sit down at my computer and spin their stories is because readers are willing to let Rebecca, Pop and Lionel into their lives. One of the hardest working authors of today, Joelle Charbonneau will have had seven books published by established publishing houses within just three years. She’s the author of two adult mystery series: The Rebecca Robbins mysteries (her latest, Skating on the Edge, releasing Oct. 2 from Minotaur Books) and the new Glee Club mystery series (Murder for Choir, July 3, Berkley Books). Charbonneau launches the first of her Graduation Day young adult trilogy in May 2013 from Houghton Mifflin Harcourt Children’s. Early readers are calling The Testing a mix between the high school ACT and The Hunger Games. A storyteller at heart, Charbonneau has performed in a variety of opera and musical theatre productions across Chicagoland. In addition to her stage work, she has also performed with several bands and worked as a solo performer. She now teaches private voice lessons and uses her stage experience to create compelling characters in her books. She also gives lectures about surviving rejection in the entertainment industry. Charbonneau earned her bachelor’s in vocal performance at Millikin University in Decatur, Illinois, and went on to DePaul University for her master’s in opera performance. The mother of a toddler, she hardly ever sleeps. And when she’s not writing, she’s either signing, cooking or watching sports.